Annie Lennox married for the third time in an intimate ceremony on 15th September. Annie met her husband Dr Mitch Besser in 2009, when she worked with his charity Mothers2Mothers. The charity helps single mothers and children with Aids. They celebrated their wedding with a boat party on the Thames. Annie’s two daughters Lola and Tali were bridesmaids at the ceremony. 150 friends and family attended the celebration including Actor Colin Firth and comedienne Ruby Wax. The legendary Scottish singer performed at the Queen’s Diamond Jubilee concert and the closing ceremony of the Olympic Games in London this summer. Annie shared two pictures of her wedding flowers with fans on Facebook and Twitter. 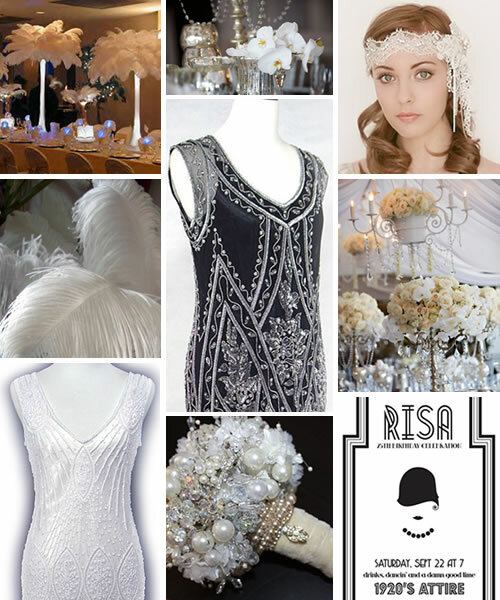 The bride wore a floor length ivory lace gown and 1920s style headpiece. 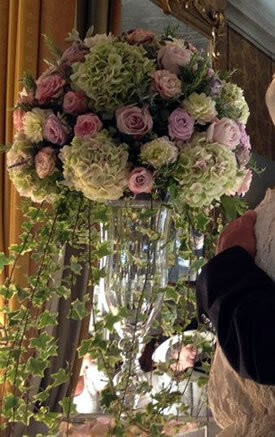 The couple chose flowers in a vintage pastel palette including roses, dahlias, hydrangea, rosemary, sage and ivy. 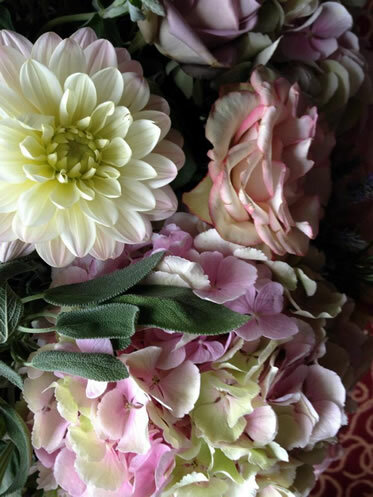 The beautiful bouquet Annie posted a picture of contains garden roses, hydrangea, and dahlias in antique pink, lilac and ivory tones. 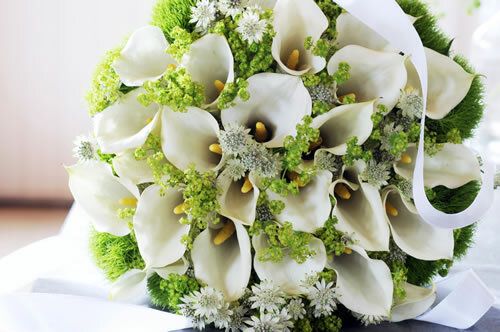 The soft green sage complements the flowers and also adds a wonderful fragrance to bouquets. Annie had previously said would not marry again, which proves that love really does conquer all. 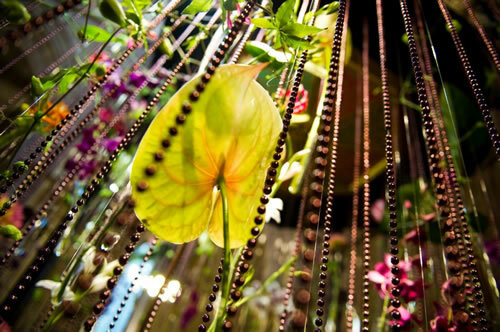 Add some drama to your wedding or event with a floral chandelier. 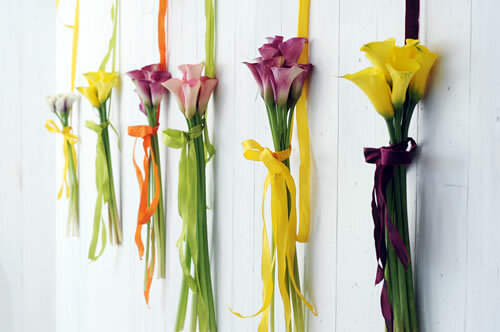 It will create a focal point in the room and be a real talking point for guests. Earlier in the summer I posted some articles about the Chelsea Florist of the Year and Young Florist of the Year competitions. 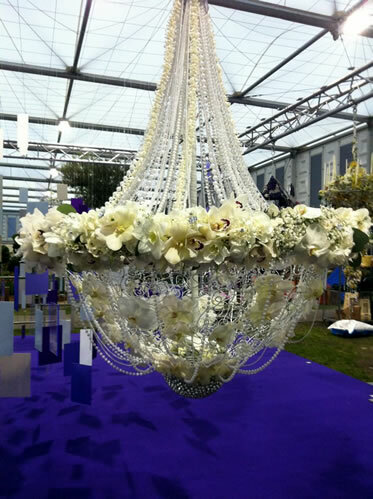 The florists had to create a floral chandelier for the Queen’s Jubilee dinner. Some of the lucky entrants even got to meet the Queen when she visited the show and admired their work. 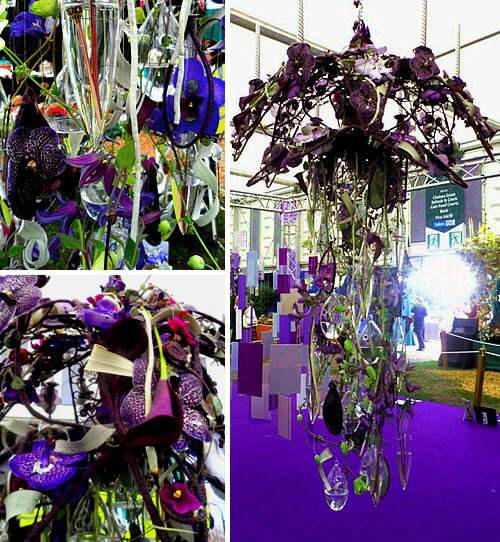 Today I’ve got some more chandelier inspiration for you and a few more of the amazing chandeliers from Chelsea Flower Show. The design above has been attached to a chandelier in a wedding marquee. 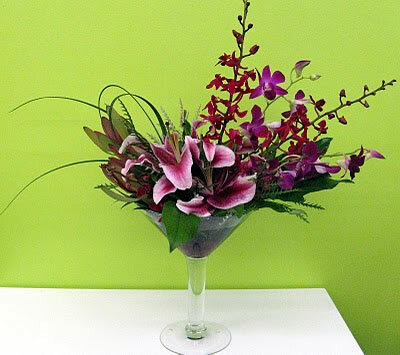 It features vibrant lime, purple and cerise flowers, with dendrobium and phalaenopsis orchids hanging down. 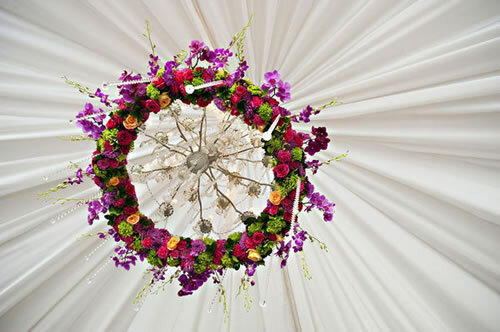 The stunning chandelier above was made by Jessica Rose Andrews from The Garden Rose florist. The design is based on a chandelier frame wrapped with textiles and hanging glass baubles. I love how the intense indigo and violet flowers contrast with the green passion flower vines. Jessica was awarded a gold medal for her design. 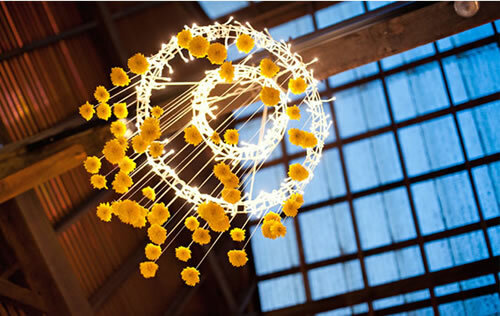 This chandelier by Betsy Ford is a simple but effective wedding decoration. Betsy has hung germinis from a chandelier of fairy lights. Katie-Jane Pridmore made this very elegant design, it contained lots of strings of pearls and intricate wire work. 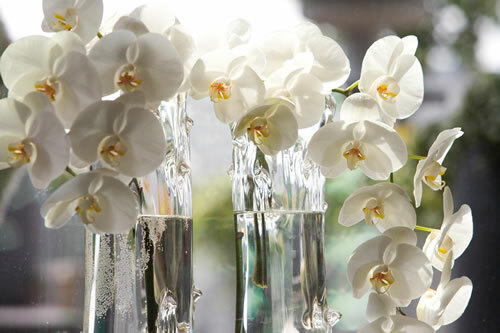 The central garland of flowers contained phalaenopsis orchids, cymbidium orchids, carnations and gypsophila. Katie-Jane received a Silver Grenfell medal for her piece. This beautiful tiered chandelier is by Erica Tippett of Bleujen Florist. I really like this design, it was awarded a Bronze Grenfell medal, which I think is a bit mean. The design features gold chains and hundreds of hanging crystals. 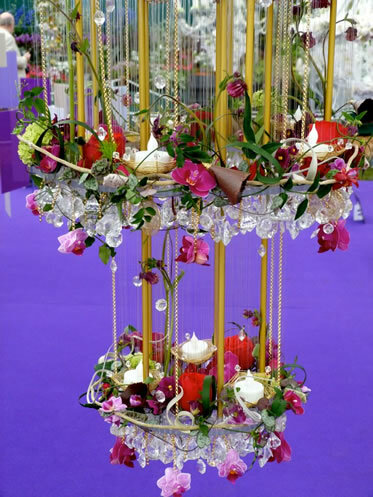 Floral Chandeliers can be very extravagant with hundreds of flowers and twinkling crystals, like the ones at Chelsea show or quite simple. If your venue already has a central chandelier, your florist may be able to make a simple design of hanging flowers to rest on it. 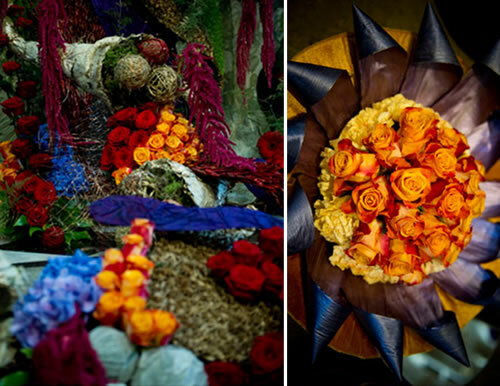 Which ever style of design you decide on it is sure to create wow factor and be remembered by your guests. The breath-taking designs were inspired by William Shakespeare, the Olympic Stadium and the blossoming of the earth. 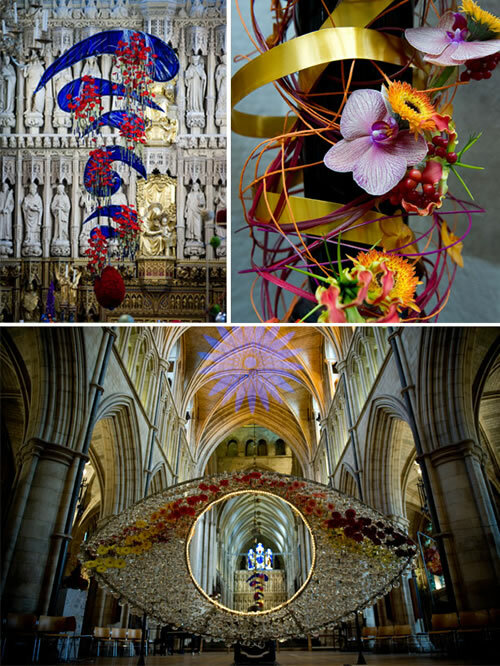 The innovative displays were tucked into alcoves, suspended from nave ceilings and woven into pastoral scene to take visitors on a journey of colour, perfume and imagination. Celebrities including Sir Ian McKellen, Su Pollard and Wendy Craig were among special guests at the preview evening last Thursday. 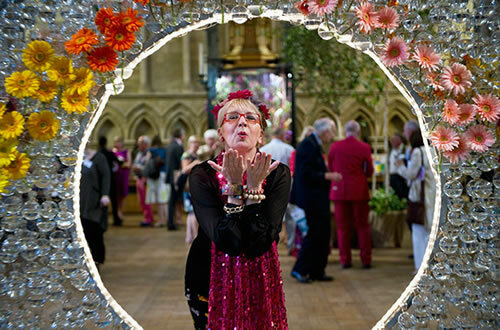 The Leprosy Mission’s National Director Peter Walker, said he hoped the beauty of the cathedral enhanced by the magnificent floral design, would reflect The Leprosy Mission’s passion for transforming lives around the world. 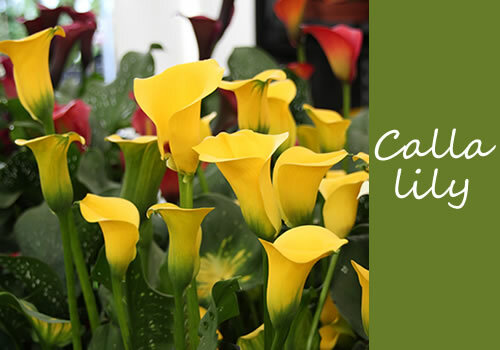 For more information about the Festival of Flowers or to donate visit The Leprosy Mission website.